Singer Avraham Fried relates how he lost his voice during a performance - and how it returned after following the Rebbe's instruction. The Hasidic singer Avraham Fried appeared yesterday at an event organized by the Jerusalem Cemetery Council. 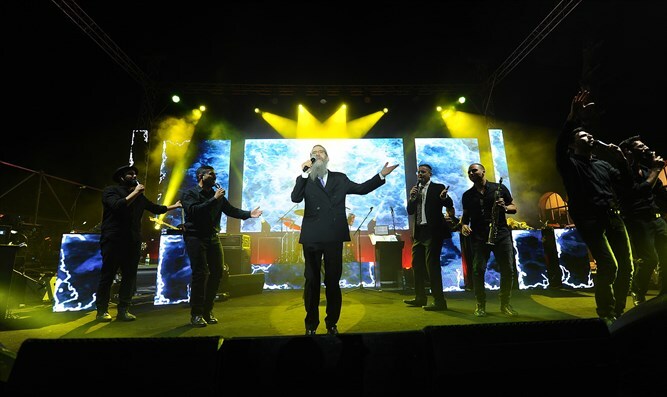 The performance took place at the Mount of Olives and saw the participation of thousands of people. A short time before the performance, Fried’s voice began to develop a slight hoarseness. He began by apologizing to thousands of people for his cracked voice. "I asked the Holy One, blessed be He, ‘I am in your hands,’ return my voice to me so that I can merit to bring happiness to many Jews who came from near and far to the event, and I gave tzedakah (charity), as I do according to the instruction of the Lubavitcher Rebbe, of blessed and righteous memory, before every concert,” Fried told the audience. A few minutes passed, and his voice returned to normal. Fried went up to sing. Rabbi Hillel Horowitz, director of the Jerusalem Cemeteries Council, spoke at the ceremony and thanked the singer for coming with great devotion to make people happy. "Thanks to the strengthening of Jewish sovereignty on the Mount of Olives, there has been a rise in the hundreds of percent of people coming to visit the graves of their families and rabbis on the Mount of Olives, and the demand has also grown to bury loved ones near the place of the Temple. In the past two years, not a single grave has been smashed on the Mount of Olives,” he said.